Pity any 3-year-old that had the misfortune to come along the year after Secretariat. Talk about a tough act to follow. Well, it could have been worse. At least 1974 3-year-old champion Little Current didn’t have the bad luck to come along the same year as Secretariat, as did the unfortunate Sham. What Little Current did manage to do was ride along on the tail of Big Red’s comet, drawing the attention and following of all those hoping for history to repeat itself. So, Little Current became the first horse to attempt to reach the lofty standards set by the 1973 Triple Crown winner. Little Current certainly was no Secretariat, but he did provide racing fans with some unforgettable thrills, thanks to an explosive closing punch not seen on the Triple Crown trail since the days of Silky Sullivan. 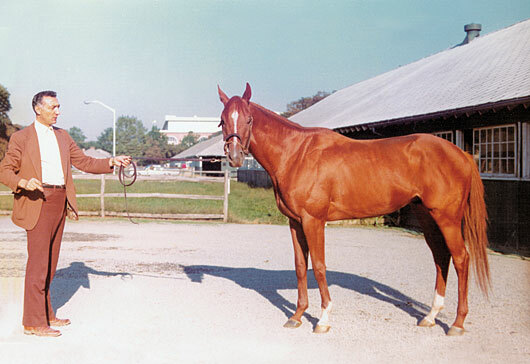 The long, lanky chestnut may have faded from memory after 40 years, but he did find his niche in the history books, and became very special to one person, who watched him grow from a yearling into a champion. Horses are like music. They take you back to a specific time and place in your life. To most everyone, the name Little Current evokes tranquil images of a gently flowing stream. To me, it evokes a different kind of tranquility; one of lazy spring afternoons and newborn foals and carefree yearlings dashing up and down rolling hills with joyous abandon. It also evokes images of one of the most unusual and memorable Triple Crown seasons. The name Little Current brings me back to the spring of 1972. Staying at Darby Dan Farm as a guest, I was able to witness the birth of a foal for the only time in my life. The mare I saw gave birth to a chestnut filly by Stage Door Johnny on a cool spring morning was named Luiana. Coincidentally, earlier that day, I had watched Luiana's yearling colt by Sea-Bird being led out to his paddock. He was a long, lean colt with a narrow stripe down his face and he had a certain undeniable presence about him. I whipped out my new Canon AE-1 and took a photo of him as the groom stopped and allowed him to pose for the camera. My next image of Little Current came at Saratoga in 1973 when the precocious, speedy colt, wearing blinkers, pressed the early pace going 5 1/2 furlongs before fading to fifth under Angel Cordero. In his previous start, his career debut, he set all the pace and was caught late, finishing third, beaten a half-length. It was obvious these tactics were not the way to go, especially with a son of the staying Sea-Bird. Trainer Lou Rondinello decided to teach the colt how to rate and removed the blinkers for his next start 3 1/2 months later at Aqueduct. Never before could I remember such a dramatic change in a horse’s running style, as Little Current rallied from far back in eighth to finish second, and in his next start came flying from 10th to win going away by 1 3/4 lengths in a sharp 1:22 2/5 for the seven furlongs. The colt took his new running style to the extreme as the distances stretched out, and he became such a plodder there was no way he could make up the necessary ground coming from so far back. 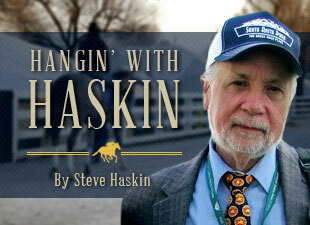 As the 1974 Triple Crown season approached, everyone’s thoughts went back to the year before. Thanks to Secretariat, racing had undergone a dramatic change. It had infiltrated mainstream America unlike any other time in memory, perhaps going all the way back to Seabiscuit in the 1930s. The sport had been hammered into public consciousness by Big Red, who graced the covers of Time, Newsweek, and Sports Illustrated in the same week. With the Sport of Kings once again being hailed and celebrated nationally and having a horse sit upon the throne that was once occupied by its immortal ancestors, all eyes turned to the 1974 Kentucky Derby, as America anxiously awaited an encore performance. Who would be the next superstar to follow in the massive footprints left by Secretariat? In the Hutcheson Stakes, Little Current hardly looked like that horse, as he was last of 13 nearing the head of the stretch, 16 lengths back, and rallied to finish fourth, beaten 2 3/4 lengths. But that a sprint and surely he would relish two turns. Then came the 1 1/16-mile Fountain of Youth Stakes, and Little Current actually dropped even farther back off the pace. Racing in 14th, 25 lengths back, he still was 17 lengths back at the quarter pole and 11 lengths back at the eighth pole, eventually finishing sixth, beaten 4 1/4 lengths. He certainly had the closing punch, but was leaving himself with too much to do. The Florida Derby was no different, as he dropped back to 15th, 23 lengths back, and could only manage to finish fifth, beaten 6 3/4 lengths, while being bumped soundly making his move. These efforts were becoming frustrating to Rondinello, who was unable to get the horse closer to the pace. The only ray of hope for the big races coming up was that Little current was at least closing fast in the final furlong, albeit way too late. Despite these plodding efforts, Little Current still was sent off at 7-2 in the 1 1/8-mile Everglades Stakes, and being a more reasonable 12 lengths back this time, he came charging home to win by a half-length. Just like that, he had become a legitimate Derby contender. But when he could only manage a fourth, beaten 4 1/2 lengths, in the Flamingo Stakes and fourth, beaten 4 1/4 lengths, in the Blue Grass Stakes, not much was expected of him in the record 23-horse field in the Kentucky Derby other than the fact he was bred for the 1 1/4 miles. All the elements were right. It was the centennial running of the Derby. Princess Margaret of England was in attendance. The day shone brightly. Unfortunately, of the 23 horses who cluttered up the Churchill Downs track, none had shown anything to suggest he deserved to be mentioned in the same breath as Secretariat. When Cannonade, the lesser half of the Woody Stephens-trained entry, came home victorious for his seventh victory in 22 career starts, racing's new groupies found themselves without a star to idolize. But few had noticed Little Current hopelessly trapped in back of the massive throng of horses. Few noticed a desperate Bobby Ussery snatching him up and yanking him to the outside, winding up 15-wide turning for home. And few noticed the colt charging by 12 horses in the final quarter-mile to finish fifth. You needed a telescope to find Little Current during the running of the race, he was so far back, racing dead-last. After a half, he still was back in 21st, 22 lengths back. Then on the turn, Little Current started picking up steam and was flying as they neared the head of stretch. But he was still back in 17th, 18 lengths behind the leaders. Running into a wall of horses, Ussery just swung him to the outside. Little Current accelerated so quickly he pretty much blew the turn, winding up closer to the outer rail than the inner rail. He passed horses at an incredible rate in the stretch, and was beaten a total of 6 1/2 lengths, giving his supporters reason to hope in the Preakness, despite the race being a sixteenth of a mile shorter than the Derby. What made me confident enough to tout the horse heavily, was looking at a ground level photo taken by DRF photographer Ray Woolfe Jr. at the head of stretch and seeing Little Current seemingly out on an island by himself, about eight horse paths wider than the horse inside him, who was himself about eight wide, I knew Little Current was going to be an overlay in the Preakness, especially at odds of 13-1. With Miguel Rivera replacing Ussery, Little Current, breaking from post 2 in the 13-horse field, hugged the rail the whole way, and this time was no more than a dozen lengths off the lead. Around the far turn, Cannonade cruised up to challenge for the lead, but you could see Rivera was sitting on a time bomb, waiting to be detonated. When the rail opened up, Little Current put in one of the most spectacular runs in Preakness history, evoking images of, yes, Secretariat’s sensational early last-to-first move the year before. Little Current, still 10th at the three-eighths pole, blew by everyone so quickly at the three-sixteenths pole, no one knew what hit them. He continued to open up, winning by seven lengths in 1:54 3/5, missing the track record by three-fifths of a second. Racing fans who had been searching for another exciting, handsome chestnut to revere found one in Little Current. A new golden idol had been discovered at Old Hilltop. Had we seen the birth of another superstar? The Belmont Stakes would help answer that question. This time, Little Current was sent off as the 3-2 favorite. No one was concerned down the backstretch when he had only one horse beat and was racing a dozen lengths off the lead through slow fractions of :49 3/5 and 1:14. This time, Little Current had clear sailing and took the outside path, once again inhaling his opponents in a flash and drawing off to another seven-length victory. All everyone kept talking about was how Little Current, with a better trip, would have emulated Secretariat and swept the Triple Crown. So, racing had another exciting star on the heels of Secretariat, this one a stone closer who had the ability to annihilate his foes with one blow, much like Whirlaway did on so many occasions. But the Belmont would be Little Current’s final trip to the winner’s circle. He ran dynamite races in both the Monmouth Invitational Handicap and Travers Stakes, again turning in spectacular stretch runs, but each time his big run came up inches short of catching Holding Pattern, who was in receipt of 10 pounds at Monmouth and five pounds at Saratoga, the latter run in a sea of slop, with Filly Triple Crown winner Chris Evert finishing 4 1/2 lengths behind Little Current in third. Looking at a possible trip to the Arc de Triomphe, Little Current tried the grass in the Lawrence Realization, but never ran a lick, finishing a well-beaten sixth. An injury forced his early retirement, leaving behind two of the most explosive victories in Triple Crown history and two heartbreaking defeats. He was syndicated for $4 million and retired to Darby Dan Farm, where in 1984 he was visited by Queen Elizabeth. Little Current would sire 35 stakes winners, including grade I winners Current Hope and Prize Spot. His name can also be found in the female family of Kentucky Derby and Preakness winner Funny Cide. Following his years at Darby Dan, Little Current stood at Buck Pond Farm near Lexington and later at Good Guys Farm in Louisiana before heading to Washington State. 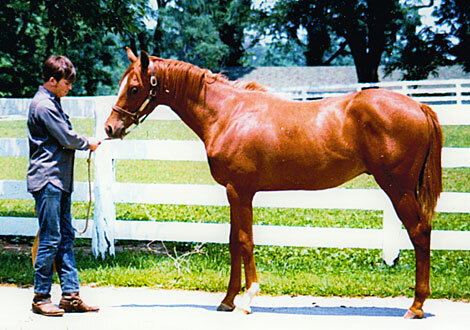 Although all comparisons to Secretariat had died a quick death, Little Current's story never did die. A combination of longevity and the efforts of his number one fan, Kevin Grace, who worked at the time for Pimlico and Laurel, kept his heroics alive and brought him close to new generations of racing fans. As he grew older and departed Kentucky, he became a national equine treasure in Washington, where he was pampered like a king by veterinarians Ann and Mark Hansen until his death from colic on Jan. 19, 2002 at age 32. Racing had lost the oldest living Preakness winner and Belmont winner. Up until Little Current’s death, the Hansens never spent a moment around the horse without feeling as if they were in the presence of greatness and they treated him as such. Little Current didn't fill Secretariat's shoes, but the way he was treated by the Hansens, he sure lived a long time thinking he did. After four decades, Little Current’s name has become all but lost, buried in a decade of Triple Crown winners and legendary champions. For me, I never got a chance to see Little Current again after his stay at Darby Dan as a stallion. All I have are wonderful memories and an 8"x10" color photo of a yearling who captured my heart, and for a brief moment in time the heart of America. When you come to think of it, that's plenty.